Earlier I posted what I had responded to a friend in another state’s inquiry about Texas Governor Rick Perry. But I left out some important things that obviously become more relevant as scrutiny of Perry increases and Democrats will highlight every possible negative, as they did Perry’s statement about it being “near treasonous” if Fed Chair Ben Bernanke should pursue another round of dramatically increasing the supply of American dollars. Even the supposedly unfairly conservative FOX News network repeatedly described this event as “a gaffe.” There are uncommonly some conservatives AT FOX; a few even relatively reflective and thoughtful ones. But, FOX is not on the whole, even conservative. That it is more so than other networks speaks infinitely more about the relative ideological oblivion of those other networks. I only see it as relatively conservative in that it allows any conservative sentiments to be expressed. I can say that perhaps Perry should not have made that statement. But sadly enough, he should not have because to dull-witted reporters and observers today, the employment of the once staple rhetorical device of hyperbole is a greater offense than ACTUALLY DE-VALUING THE NATIONAL CURRENCY! The first is rhetoric to make a point. The second is treacherous (ironically the adjective that Perry first used and corrected) to the people of the nation. This is only one more example of why I lament that I live under the communications and educational social crop-dusting of so simple-minded and errant people. They should be free to corrupt their own society. Must the rest of us passively watch as they corrupt OURS? REALLY?! But I did originally say that in his 10+ year time as Governor of Texas, the former Democrat Perry has had some reflexes about the proper and effective exercise of government power that conservatives including me have seen as misplaced, to say the least. However I say that he plainly is learning, and particularly quickly amid the onslaught of President Obama and Congressional Democrats in his first 2 years and his continued overreach through regulatory agencies. And I think he would be very cooperative with a Republican Congress as President, though we really need leadership of both the government and the public. But recent years to me have highlighted a strain of carnivorous conservatism that will not forgive past mistakes, branding those who have committed them as irredeemable and dangerous liberals or “RINOs,” a word I accepted a long time ago when Democrats took on the Republican name as camouflage in a Texas that was swinging Republican. But now, it’s a term that I usually hate hearing. Obviously, the 20th century was a period of ascendancy for the growing and interventionist state. And that process was facilitated by the development of an easily digestible mass-media, mostly administered by a relatively insulated and unreflective liberal sub-culture. Out of that environment in the last 50 years, many Democrats have come to see great problems with the overactive and over-sized state, including many prominent Republicans. Most notable of course, was Ronald Reagan, who directly defied the dominant culture after once having voted for Franklin Roosevelt, one of the most activist Democrat presidents of the century. Perhaps because it was for most of us in the mists of distant history, but I’m not absolutely sure why Reagan is given a pass while others are not. But there are many conservatives in Texas who dislike Rick Perry. It is true that Perry is a politician who may rhetorically list (though not flip, Romney-style) with the political winds. But that’s nothing exceptional among politicians; in fact, more accurately definitive of them. 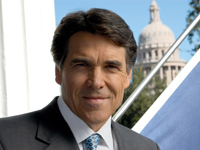 In fact only a few of the current field of Republican candidates might be less so than Perry. Reagan had an uncommon tendency to lean or outright stride into the political winds. In the next post, I’ll discuss how that propensity is particularly important in today’s situation, and the only ways we might find it. Rick Perry is no Tea Party guy...in fact he ran against the Tea Party candidate in Texas. He is Washington as usual...so if you like Washington as usual...vote for Perry. We really don't need more of this. We need integrity and ethics. Do you research voters! !